Hugh Hale is certain that his company made the right decision to purchase software after years of success building its own. The CIO of the nation's largest not-for-profit home health provider, the Visiting Nurse Service of New York, talked to us about their recently announced contract with Delta Health Technologies. HCTR: You have a staff of over 200 people in your IT department. Why not just continue to rely on home care software you build yourself? Why make such a fundamental change? Hale: Things are changing so rapidly, we decided it was more cost-effective to go out to a vendor than to build it ourselves. A vendor takes over the responsibility to keep the software updated with changing regulations and the new payment systems being planned. HCTR: There are a lot of software products to choose among that could serve the needs of an organization your size. How did you go about the search that led you to Crescendo from Delta Health Technologies? Hale: We engaged about 80 of our clinicians to help with the process. They evaluated a large number of products over the course of a year or so. We relied heavily on their opinion. We also had learned that Delta has had the some of the best customer reviews and we saw it fully functional during a site visit in Georgia. HCTR: So now the implementation phase. How is that coming along? Hale: We expect that planning for Crescendo implementation should take nine months. We will be ready for a pilot rollout during the 4th quarter of this year, a general installation about six months after that. HCTR: Who is directing the project? Hale: We have a System Integrator coordinating the implementation with Delta's people and our own team. HCTR: Because Crescendo is a hosted system, you won't be investing in servers but what about field devices. I assume you'll need quite a few of them. Hale: Together, we decided to standardize on the Lenovo Yoga 2 Pro Laptop because it can operate in tablet or laptop positions and our clinicians liked it. We'll be acquiring enough of them over time to accommodate our 3,500 clinicians. HCTR: Lastly, you have the challenge of software training for that many clinicians. I know you have many internal resources but that it a major undertaking. Hale: We see it as a logistical puzzle. Yes, it will be a challenge but we have great people. Overall, I am excited as we approach this project. 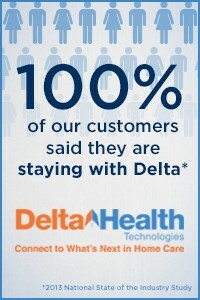 I see it as a true partnership with Delta, a strong one. We are going into this with confidence and optimism. ©2014 by Rowan Consulting Associates, Inc., Colorado Springs, CO. All rights reserved. This article originally appeared in Tim Rowan's Home Care Technology Report.